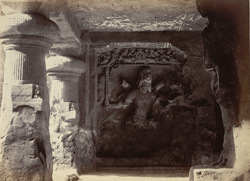 Photograph of the sculptured panel depicting Shiva spearing Andhaka in the cave temple of Elephanta in Maharashtra, taken by D.H. Sykes around 1871 in James Burgess' illustrated book 'The Rock-Temples of Elephanta or Gharapuri'. This sculpture panel represents Shiva under a violent and angry form, impaling the demon Andhaka. The face of the god expresses rage and fury as well as his attributes, Bhairava meaning horror and Kapalabhrit being referred to the necklace of human skulls he wears. The panel is situated on the west entrance of the great Shiva temple of Elephanta which was excavated in the 6th century, Kalachuri period. The temple consists of a series of chambers cut from the rock. At the centre of two excavated courts there is a hypostyle hall of 20 pillars in which stands the Linga shrine. The east entrance leads towards the sanctuary and the north entrance towards the great Trimurti or triple-headed bust of Shiva.